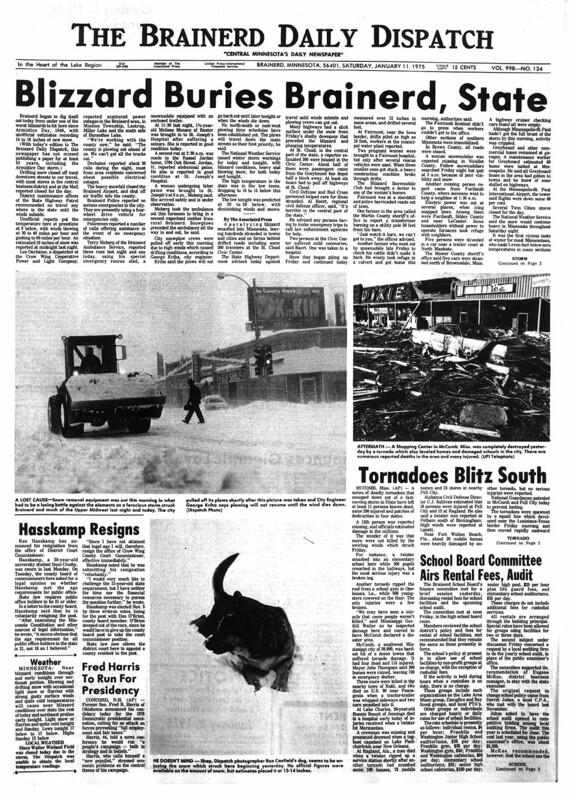 The Great Storm of 1975 (also known as the Super Bowl Blizzard, Minnesota's Storm of the Century, or the Tornado Outbreak of January, 1975) was an intense storm system that impacted a large portion of the Central and Southeast United States from January 9 to January 12, 1975. The storm produced 45 tornadoes in the Southeast U.S. resulting in 12 fatalities, while later dropping over 2 feet (61 cm) of snow and killing 58 people in the Midwest. This storm remains one of the worst blizzards to ever strike parts of the Midwest, as well as one of the largest January tornado outbreaks on record in the United States. The storm originated over the Pacific Ocean and crashed into the Northwest Pacific coast with damaging gale-force winds on January 8, 1975. By January 9 it had cleared the Rocky Mountains and began to redevelop and strengthen. At the same time, Arctic air was being drawn southward from Canada into the Great Plains, and large amounts of warm tropical air from the Gulf of Mexico were being pulled northward into much of the eastern U.S. The storm was a classic Panhandle Hook which moved from Colorado into Oklahoma before turning northward towards the Upper Midwest. It produced record low barometric pressure readings in the Midwest, with the pressure falling to an estimated 28.38 in (961 mb) just north of the Minnesota border in Canada. An unusual feature of this outbreak was that daytime heating, typically a key ingredient in the formation of tornadoes, had very little impact on their development. Rather, as the storm system pulled out into the central plains, strong thunderstorms and tornadoes quickly began to form despite the late hours. The first two tornadoes in the outbreak touched down after 10:00 p.m. CST on January 9 in Oklahoma and Louisiana. From there the progression of the twisters shifted eastward through the overnight and early morning hours, setting the stage for what would turn out to be a record-setting day on January 10. Texas saw five tornadoes between 1:30 a.m.–3:30 a.m., one tornado touched down in Arkansas at 6:00 a.m., Louisiana saw seven tornadoes between 5:30 a.m.–8:00 a.m. (killing one person), Mississippi had five tornadoes between 8:15 a.m.–10:00 a.m. (killing nine), and Illinois and Indiana each experienced three lunch-hour tornadoes. The tornadic line of storms then shifted into Alabama (killing one) and Florida during the afternoon and evening hours. Mississippi and Alabama were the two states hardest hit by this outbreak. Alabama saw the most twisters of any state with 13, but Mississippi saw the largest and deadliest tornado. An F4 tornado that tore through Pike, Lincoln, Lawrence, and Simpson Counties at 8:14 a.m. killed nine people and injured over 200; severely damaging 38 blocks in the town of McComb. The 39 tornadoes that touched down on January 10 marked the most active tornadic day in January in U.S. history at that time. The 52 tornadoes that touched down during January 1975 also set a U.S. record for the most tornadoes during that month. Both of these records were eventually broken in January 1999. After a calm day on January 11, four more tornadoes touched down in Florida and Georgia on January 12, killing one person in Florida. By the time the outbreak was done it had produced 45 tornadoes, killed 12 people, injured 377 and caused $42 million in damages. (28.8 km) Two homes were destroyed, along with numerous barns and outbuildings. Two trailers were also destroyed in the Alsatia area. A church and a parsonage were damaged as well. Six people were officially injured, but the actual total may have been three. (21.6 km) 1 death – A trailer was destroyed near the touchdown point, resulting in the fatality. In Crowley, six trailers and seven homes were damaged. Eight people were injured. (90.4 km) 9 deaths – This long-tracked tornado, possibly a tornado family, destroyed seven buildings and a marina near the beginning of its path. Major damage occurred in McComb, where many homes, apartments, vehicles and businesses were completely destroyed. Two schools and two National Guard armories were badly damaged as well. The tornado injured five students, out of 325 who had taken shelter in a school. Many homes, trailers, and barns were destroyed in rural areas as well. In the community of "Camper", a trailer was completely destroyed, with its remains twisted around a utility pole. 210 people were injured and at least 10,000 trees were snapped or uprooted. (24 km) This tornado overturned a truck on I-20. It also destroyed a home and badly damaged another. One person was injured. (0.16 km) A brief touchdown destroyed two homes and two trailers near Helena. (3.2 km) A short-lived tornado destroyed four houses, along with two trailers. Four minor injuries occurred. (30 km) 1 death – In Pell City, the tornado destroyed 49 homes and damaged 259 others. 15 trailers and 27 businesses were damaged or destroyed as well. The tornado also destroyed five homes in Ragland, where 48 others were damaged. (1.6 km) A brief tornado produced major damage in the Cotton Valley area, destroying 17 homes and damaging 28 others. Nine people were injured. Rating disputed, ranked F3 by Grazulis. (0.16 km) A brief touchdown destroyed three homes and five trailers. It also damaged 22 homes and injured six people. Rating disputed, ranked F3 by Grazulis. (84.8 km) A tornado destroyed a barn, and a house lost its roof. 12 people were injured. (269.6 km) 1 death – This was probably a family of skipping and shorter-lived tornadoes. In Florida, 25 homes and trailers were torn apart. In Georgia, many trees were snapped and uprooted, and buildings were destroyed at an industrial park. 100 homes and 50 trailers were damaged in Georgia as well. A total of 18 people were injured. (3.2 km) A brief tornado overturned trailers and tore roofs from several homes. Businesses in the area were destroyed as well. As the storm system began to move northeastward out of Oklahoma, the cool air behind pulled down behind the system interacted with the moisture being pulled northward to produce snow over a large part of the Midwest. The snow began falling on Friday, January 10 and continued for the next two days. Snowfall of a foot (30.5 cm) or more was common from Nebraska to Minnesota, with a high amount of 27 inches (69 cm) in Riverton, Minnesota. The heaviest snow fell to the west of the low pressure center, which tracked from northeast Iowa through central Minnesota up to Lake Superior. Sustained winds of 30 – 50 mph (48 – 80 km/h) with gusts from 70 – 90 mph (113 – 145 km/h) produced snowdrifts up to 20 feet (6 m) in some locations. Some roads were closed for up to 11 days. Sioux Falls, South Dakota saw visibilities of below 1⁄4 mile (0.4 km) for 24 straight hours, and just east of Sioux Falls a 2,000-foot (610 m) broadcast tower collapsed under the storm's fury. In Willmar, Minnesota, 168 passengers were trapped in a stranded train for hours, unable to walk to shelter because of dangerously low wind chill values. In Omaha, Nebraska a foot (31 cm) of snow fell, Sioux Falls saw 7 inches (18 cm), Duluth, Minnesota saw 8 inches (20 cm), and International Falls, Minnesota saw 24 inches (61 cm). Record low pressures were recorded in communities in Nebraska, Minnesota, Illinois, and Wisconsin, with a low of 28.55 in (966.8 mb) in Duluth, Minnesota. In all, approximately 58 people died from effects of the blizzard and over 100,000 farm animals were lost. The combination of snowfall totals, wind velocities, and cold temperatures made this one of the most severe blizzards the Upper Midwest has experienced. This storm system had, in part, a large effect on the weather in the entire eastern half of the country. A number of different weather records (at the time) were set during the four days of this storm, especially in daily high temperatures, wind gusts, low barometric pressure readings, and number of tornadoes. ^ a b Watson, Bruce (January 7, 2000). "1975 Blizzard". PBS. Archived from the original (.ram) on June 27, 2006. Retrieved 2007-05-21. ^ National Geographic. "Forces of Nature". Archived from the original on 2006-10-05. Retrieved 2006-12-14. ^ a b NCDC. "Storm Event Database". Archived from the original on 2009-05-09. Retrieved 2006-12-14. ^ NOAA (November 19, 2003). "Tornado Outbreak, January 21, 1999". Archived from the original on January 12, 2007. Retrieved 2006-12-14. ^ NOAA (February 9, 1999). "JANUARY TORNADO NUMBER BREAKS NATIONAL RECORDS". Archived from the original on 2006-09-29. Retrieved 2006-12-14. ^ NWS – Milwaukee. "A Century of Wisconsin Weather in Review". Retrieved 2006-12-14. ^ NWS – Duluth. "Memorable Northland Storms". Retrieved 2006-12-14. ^ Minnesota Public Radio. "A Prairie Home Companion". Retrieved 2006-12-14. ^ a b NWS – Sioux Falls. "Big Weather Events of the 20th Century at Sioux Falls, South Dakota". Retrieved 2006-12-14. ^ Seely, Mark W. (2006). Minnesota Weather Almanac. Minnesota Historical Society press. ISBN 0-87351-554-4. ^ NWS – Sioux Falls. "Siouxland Weather History and Trivia January". Retrieved 2006-12-14. This page was last edited on 19 December 2018, at 22:14 (UTC).